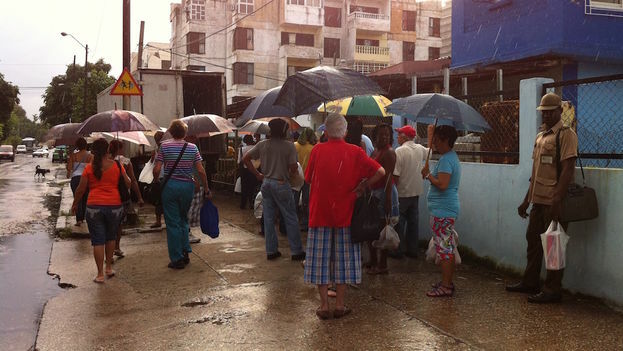 14ymedio, Rosa Lopez, Havana, 19 August 2015 – She boasts that she “walks all over Havana” and there isn’t a single store, market or point of sale she doesn’t know about. “I have a family to feed and for years I’ve also taken advantage of my walks to tell the neighbors where they can get something,” sais Maria Eugenia, 58, who these days never stops repeating, “everything is bare.” The food shortage has gotten worse in recent weeks and the situation has reached crisis levels in many places. “There is no chicken, no chopped soy-meat, no sausages, and never mind meat,” details this stubborn housewife. The refrigerators in the stores of the Cuban capital have hardly any merchandise and in many cases the cooling system has even been turned off, to avoid wasting electricity. “People don’t know what is happening, because they don’t explain it on television,” the lady complains. Few markets are spared the deficit in products. Ultra, a store in the heart of Central Havana, is one of the most affected. “It’s been days with no supply of chicken and when it comes it’s very little, people have even come to blows the get a package,” an employee who preferred to remain anonymous explained to 14ymedio. On Tuesday, a sign proudly announced, “We have butter,” but there was nothing else to see in the windows of the meat and freezer departments. If they would at least carry hot dogs,” a woman with her baby pleaded, looking over the empty shelves. The frustrated customer was talking about the chicken sausages imported from the United States, Canada or Brazil, one of the food products in greatest demand among the Cuban population, given its low price and the number of hot dogs included in each package. The last week dozens of telephone calls crossed the city to let family and friends know that “sliced mortadella is available” in the store at San Lazaro and Infanta. The message was brief and accompanied by a “hurry, before it runs out.” Two hours after the product processed by the Canadian firm Golden Maple was put on sale, this newspaper was able to confirm that it had run out. “There’s no powdered milk anywhere,” bellowed a young man outside the Carlos III Plaza Monday morning. With a mother who had recently suffered a hip fracture, he shouted, “I must get milk,” perhaps hoping to reach the ears of any underground seller passing through the area. There is a particular shortage of products from the United States. The import figures from that country have plummeted in the last year. If in the first quarter of 2014 the island imported $160 million in food from the US, in 2015 that figure has barely reached $83 million, according to MartiNoticias. The effects of this decline are visible in the shops. “Every day it is more difficult to cook and give food to the children,” says Yanisbel, a 34-year-old mother of two, one of which is gluten intolerant. The woman was surprised that, “with all the contact we have now with the yumas (Americans) we’re no longer seeing the products that used to come from that country.” As an example he mentions frozen chicken, ground soy-meat, various kinds of tomato sauce. The lack of liquidity to pay cash in advance for purchases from the U.S. has dented what seemed to be a growing trade. Moreover, the Cuban government’s poor credit history and unpaid debts does not favor the search for new suppliers. During the last session of Parliament, Marino Murillo Jorge, Minister of Economy and Planning, confirmed missed production targets, among them the delivery of fresh milk to the industry, which fell 13 million liters shorts. With regards to the shortages of products in the hard currency stores, the official attributed it to the late arrival of imports and announced a set of provisions to better serve that market. More than a month later, the effects of these measures haven’t been felt on the plates of Cubans.